The topic of this week’s #KareoChat on Thursday, September 8 at 9:00 AM PT is Social Determinants of Health Data – specifically the collection and dissemination of data regarding behavioral and social determinants of health in electronic health records. You can find the topics that will be discussed in the chat here. This is a complex subject and I hope to share and collect some good considerations, ideas and approaches. This post presents some background info on the topic of social determinants of health. There are several good reference materials at the end of this post that discuss the capture and use of social determinants and behavioral data in EHR's. Most people think their health is ‘fixed’ by the efforts of medical research and procedures performed at their doctor’s office or a hospital; but that’s just not the case. 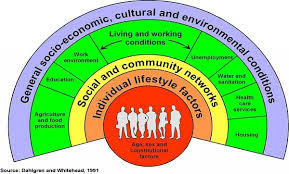 While 30% of our health outcomes may be ‘addressed’ this way, the greater balance is related to our behavioral health, social determinants, and influences of the environments in which we live and work. Our education level, where we live, how much money we have, and the problems we struggle with have been clearly linked to our well-being, the quality of our lives, our health, and how long we live. Only in the last few years has collecting data about and addressing non-medical determinants – most all of which are NOT addressed by health care systems – been recognized as key to managing healthcare outcomes and costs. And healthcare reform, value-based reimbursement, the need for increased health system and provider accountability; and the addition of millions of people to the health insurance rolls have finally created incentives to address social determinants of health; but limited availability of data on behavioral and social determinants impede widespread health outcomes improvement efforts. Capturing social determinants of health in the EHR is critical to enable health care providers to better characterize, understand the causes of, and identify appropriate interventions that health care systems (and non–health care systems) can make to improve outcomes across healthcare populations. Unfortunately, such information is currently insufficiently captured in most electronic health records. "Accounting for Social Risk Factors in Medicare Payment: Identifying Social Risk Factors"